Reigning Australian Open champion Stan Wawrinka will have to play the best tennis of his life (again) if he hopes to repeat. The first Grand Slam of the 2015 tennis season gets under way on Monday morning in Melbourne. Due to a 16-hour time difference, coverage actually begins on Sunday at 7pm in the United States. ESPN2 airs most of the tournament’s primetime matches live at around 3am, so set your recordings in advance unless you want to become nocturnal for a couple of weeks. You might be asking yourself why you should bother tuning in to see a sporting event that airs at such unusual times. Well, the Australian Open has been the most exciting tennis tournament in the world for the last ten years. Many called the 2012 men’s final between Rafael Nadal and Novak Djokovic the greatest tennis match of all time, and the epic 2009 semifinal between Nadal and Fernando Verdasco might have been even better. Just look at these ridiculous highlights. The Australian Open has also been full of surprises recently, with last year as a prime example. Huge underdog Stan Wawrinka managed to beat Djokovic 9-7 in the fifth set and then go on to win the whole tournament. Let’s take a look at what’s in store this time around. World No. 1 Novak Djokovic is favored to win this title for a fifth time. He came up short as the favorite last year, but he has an easier road to the title this time. Djokovic should reach the semifinals without too much trouble, unless Verdasco can miraculously regain his 2009 form in time for the third round. But if Djokovic does make it that far, he will likely find himself in a rematch of the quarterfinal he lost last year to Stan Wawrinka. He should be ready for the challenge this time around. 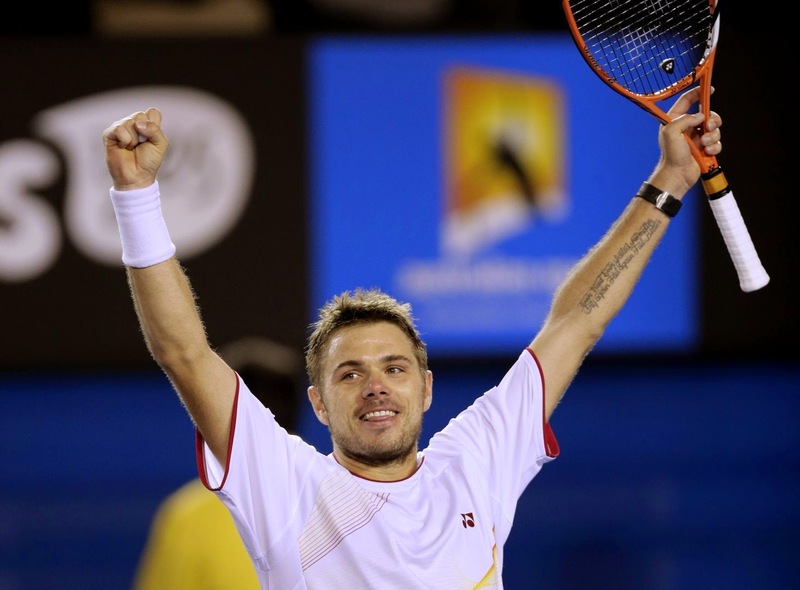 Fourth seed Stan Wawrinka will be defending a grand slam title for the first time. If he plays anywhere close to how he did last year, he should pummel his first four opponents. Then a matchup with No. 5 Kei Nishikori, who beat him in the U.S. Open quarterfinals, could be looming, followed by a showdown with Djokovic if he passes that test. Wawrinka and Djokovic have gone five sets in each of their last three Grand Slam matches, and there’s no reason to think this one will be any different. But a 16-3 head-to-head advantage for Djokovic suggests that Wawrinka’s run will end in the semifinals. Federer has not reached the finals of this event since 2010, and after a straight sets thumping at the hands of Rafael Nadal in last year’s semifinals, it looked like he might never make it back there. Nadal is slated to face him in the semifinals once again this year, but this time Federer actually has a chance to beat his rival for the first time in nearly three years. To win the title, he would likely need to beat Murray, Nadal and Djokovic in consecutive matches. As well as he has been playing, it would still be hard not to show his age (33) after those encounters. It’s amazing that Nadal has only won this title once. He has actually played some of his best tennis in Melbourne, but in four of the last five years, injuries have doomed his chances of winning the tournament. The one time he remained healthy throughout the two weeks, he lost the longest Grand Slam final of all time to Djokovic. Nadal hasn’t played a professional match since October because of an appendectomy. A healthy, in-form Nadal would waltz through his relatively easy draw into the finals. But given the rust and nagging injuries, anything could happen. Mikhail Youzhny could take him down in the first round or he could win the title. Nagging injuries hampered Murray’s year in 2014 as well. At Wimbledon, both he and Nadal failed to reach the finals for the first time at a Grand Slam since 2009. Murray finally appears recovered from 2013 back surgery, but his reward is a fourth round clash with young phenom Grigor Dimitrov, who knocked him out of Wimbledon. If he gets through that, Federer is next. Federer, Nadal, Djokovic and Murray have dominated men’s tennis for the last decade, but they now face more formidable opposition than ever before. Since the current ranking system was introduced in 2009, no more than 7 players finished with 4000 ranking points. Now every player in the top 10 has over 4000 points, and a semifinal showing by No. 11 Dimitrov would put him over 4000 as well. Dimitrov is the most exciting young athlete in tennis, but his horrible draw will probably delay his breakthrough to a major final until later this year. No. 5 Kei Nishikori, No. 7 Tomas Berdych, and No. 10 David Ferrer are the other players in the draw who have reached a Grand Slam final in the last eight years. No. 9 Marin Cilic, No. 12 Jo-Wilfried Tsonga, and No. 276 Juan Martin Del Potro would be a part of that club too, but they are sidelined with injuries. 32-year-old David Ferrer will have a hard time getting past the fourth round as well. Nishikori stands in his way at that stage, and the Japanese star has beaten Ferrer four times in a row. Nishikori will have the most to say about denying Djokovic and Wawrinka a rematch. Berdych has been consistently solid for years, but if he makes another quarterfinal run this year, he will probably lose to Nadal for an eighteenth consecutive time. No. 8 Milos Raonic is the only top-10 player who hasn’t reached a Grand Slam final, but the big Canadian’s chances of changing that here are slim. He is winless against No. 17 Gael Monfils and Novak Djokovic, the two most talented players in his section of the draw. Djokovic cruises to the semifinals. Wawrinka gets there after a slugfest with Nishikori, but runs out of gas against Djokovic. Murray battles past Dimitrov and gives Federer a tough match before falling short. Nadal finds his form after a few rounds in time for hugely favorable matchups against Berdych and Federer, and he reaches the finals. But knowing Nadal’s luck in Australia, he will tweak something and not be at 100% for the final, so Djokovic will capture his fifth title down under, setting an Open Era record. I planned on fitting a women’s preview in here too, but I had way too much to say about the men. Suffice it to say that Serena Williams will be a huge favorite and Victoria Azarenka vs. Sloane Stephens might be the best first round matchup between unseeded players in tournament history (they played each other in the semifinals two years ago). I’ll recap the women’s tournament more extensively at its conclusion in a couple of weeks.